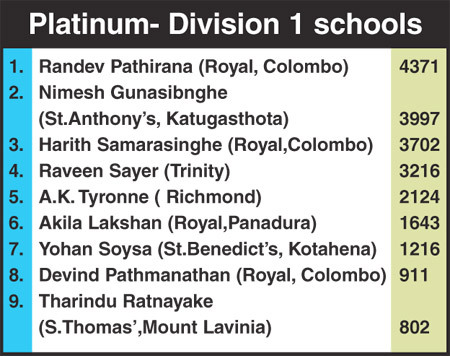 New entrants to the competition Yohan Soysa (St.Benedict’s), Devind Pathmanathan (Royal,Colombo), Tharindu Ratnayake (S.Thomas’, Mount Lavinia) and another Royalist Harith Samarasinghe, polled in the most number of votes to climb to the number three spot with 3702 votes in the ‘platinum’ category. The duo from Royal College, Colombo Randev Pathirana and Harith Samarasinghe have struck well for their team with bat and ball. With the Royal captain Devind Pathmanathan also in the running the contest is no doubt going to be an interesting tussle. 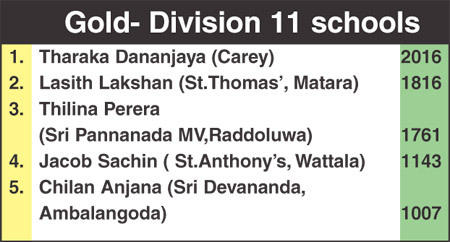 In the ‘Gold ‘ segment Tharaka Dananjaya who has been among the runs for carey College took the top spot from Matara Thomian Lasith Lakshan . 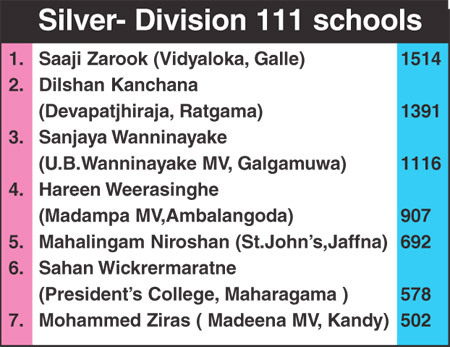 In the ‘silver category for schools taking part in division 111 Saaji Zarook of Vidyaloka College, Galle polled in 1514 votes to take over the first place from Dillshan Kanchana of Devapathiraja College, Ratgama (1391).